The team at Machinery Indents is proud to stand by behind the high-quality automatic offcoil machines in our selection. This ensures that our customer return to us time and time again for their machinery requirements. We work hard to provide services that makes a difference to the smooth running of your operation, with service that provides complete satisfaction. For further details, please not hesitate to pick up the phone and call us on 03 9357 9896. We will be happy to answer all your questions to ensure you have all the information you need. You can also use our online contact form and we will get back to you shortly. The Metronic 10 – 13 HS Plus, due to its high speed, are suitable to produce bundles of rebar with the same diameters and lengths in large quantities. The product quality is ideally suited to the demands of welded mesh producers (where maximum tolerance in straightening and cutting is a must) as well as producers and traders of cut to length rebar material. 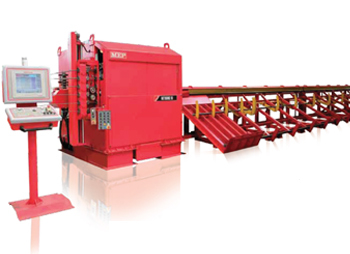 The METRONIC series consolidates all of the best technologies developed for the straightening and cutting of rebar from coil, into one unique machine. It excels thanks to its high speed (up to 8 m/s Metronic 10-13 HS Plus) and superior product quality. The exclusive pre-feeding unit (Metronic 12-16-20) automatically changes the wire in a very short time. At the same time Advanced Feeding System the straightening system reconfigures itself based on the diameter or the material to be worked and re-calling, if stored, straightening parameters previously applied. Thanks to this solution, the equipment is ready to restart production in a few seconds without any manual operation. 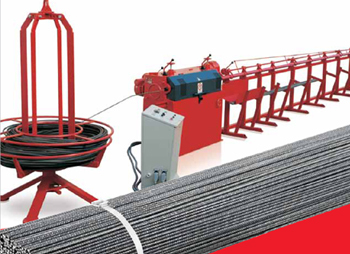 The METRONIC series consolidates all of the best technologies developed for the straightening and cutting of rebar from coil, into one unique machine. 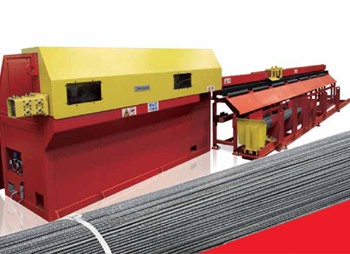 The electronically controlled automatic plants within the BITRONIC 3 and the BITRONIC 4 series allow the straightening of wire from coil, cold drawn or hot rolled wire, for the production of cut to length bars up to 12 m. The unique quality and maximum production flexibility within the specific client requirements. The RD 12 series straightening machines are designed to straighten and cut wires up to a maximum length of 12 meters. High speed, ease of use and sturdiness make them a versatile tool capable of adapting to a wide range of production requirements. Different configurations allow to set the production according to specific needs giving priority to high volume productions (same lengths) or flexibility (for different lengths). The RF series of straightening machines can straighten and cut wires up to a length of 12 meters. Their ease of use, sturdiness and the quality of the finished product makes them a reliable tool. Straightening is achieved by using a rotor group consisting of tungsten-carbide bushings chosen because of their extreme hardness and strength. Their position and pitch can be adjusted according to the diameter and the mechanical characteristics of the coil material, guaranteeing a perfectly straightened product. The RH series straightening machines are designed for straightening and cutting of wires up to a maximum length of 12 meters. Product quality, usability and sturdiness are the main characteristics of this machinery. The different configurations allow to set the production according to specific needs: high volume productions (same diameter and length), flexibility (different diameters and lengths). Automatic, electronically controlled plant of the WRR series, which allows the straightening and cutting-to-length of cold drawn and hot rolled wire from coil, up to a length of 12m.